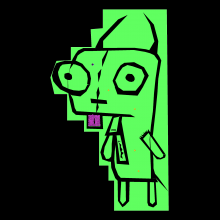 Art Game: Gir. Press Shift. It's Gir's Dog Suit... Kinda, This is my new series... of drawing...hope you like it... Next Picture... Gir, With his Dog suit half way on halfway off.